*WARNING* - Never start the engine or let it run for any length of time in an enclosed area. The exhaust fumes are poisonous and may cause loss of consciousness or death within a short period of time. Always operate the engine in the open air or in a well ventilated area. 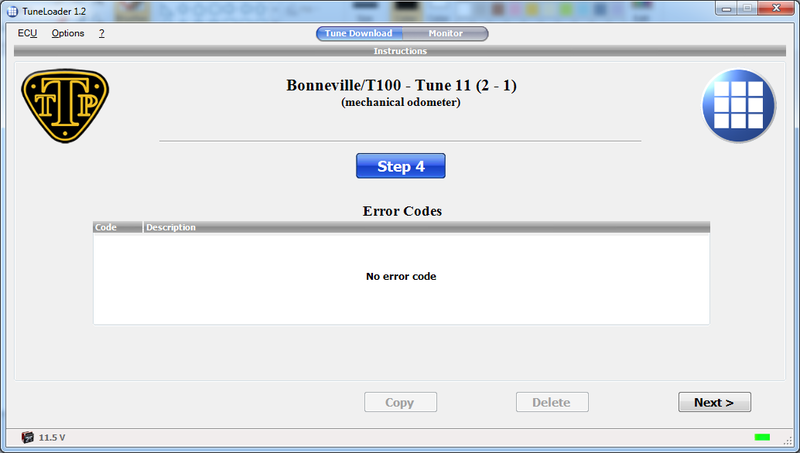 Every TTP EFI tune comes integrated with our TuneLoader software. 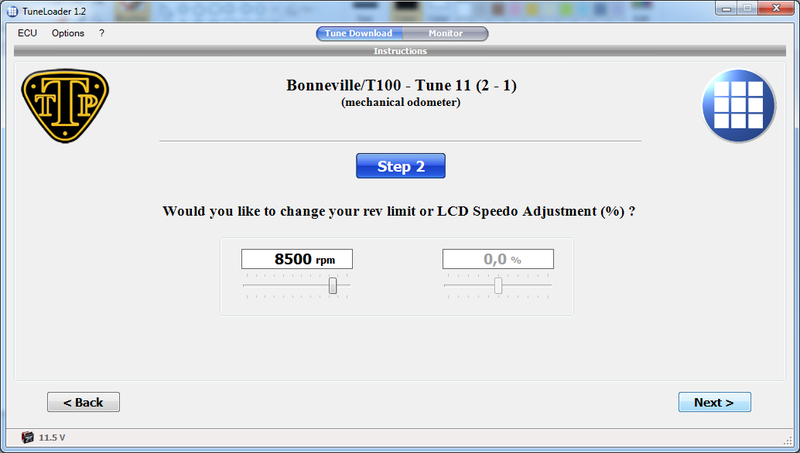 TuneLoader has two main functions, the first is to ensure that loading a TTP EFI tune is easy and intuitive with instructions for each of the six steps. The second is an engine monitor which displays RPM, TPS %, TPS voltage, induction vacuum for cylinders 1 & 2, oil temperature, TPS LED and an engine error LED. These functions can be monitored while carrying out reset adaption and maintenance. TuneLoader requirements: a Windows PC with either Windows Vista, Windows 7, Windows 8/8.1 or 10. It is also required that the PC is connected to the internet for the first run for tune activation and for the first run of the day each time you use it to check if a new updated tune is available for download. 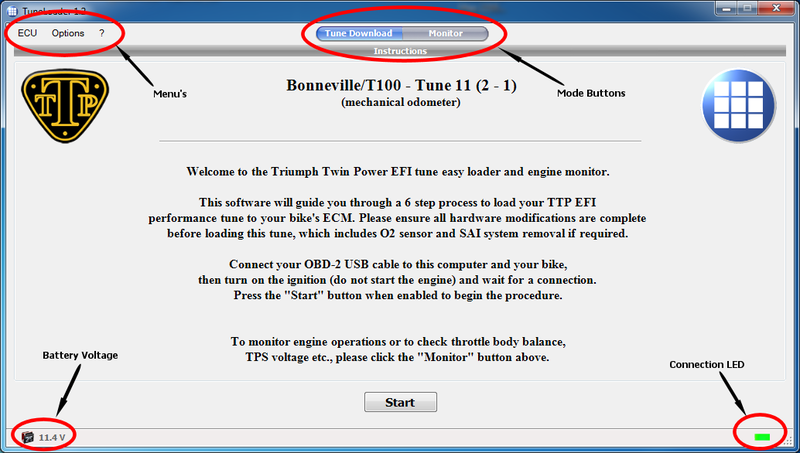 The first step in loading your TTP EFI performance tune is to make a connection from your computer to your bikes ECM (Engine Control Module). Our OBD-2 USB cable is ideal for this application, as it uses the latest version of the FTDI chipset, has a connection LED and has proven not to give the disconnection problems that other cables are renowned for. 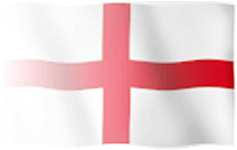 The drivers can be downloaded from HERE and they should be installed BEFORE you plug the OBD-2 USB cable in to your Windows PC for the first time. 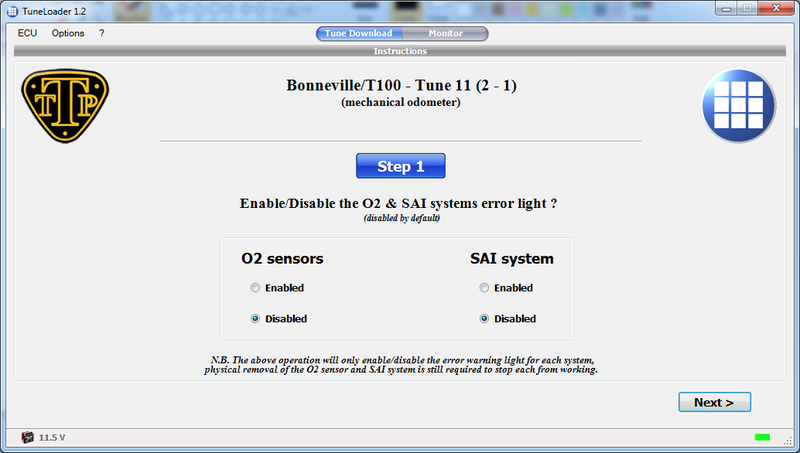 Click on the link above and run the file that is downloaded to install the drivers so that your PC is ready for when you first insert the OBD-2 cable in to the USB slot. Remove the seat from your bike and connect your OBD-2 USB cable to the corresponding OBD-2 connector which is situated behind and to the right of the battery on a Bonneville/T100, Thruxton and Scrambler and just in front of the airbox intake on an America and Speedmaster. The other end of the cable plugs in to a USB port on your computer. Your TTP performance tune files are downloaded as a ZIP file which is required to be extracted to your hard drive before use. Once extracted, there are five files in the extraction directory, an EXE file which is the TTP tune application file, a PDF user guide file (please read), a software license file and two graphics files. To run your tune file, right click on it and on the subsequent context menu click on "Run as Administrator". This will execute the file and prompt you to enter your LicenseID and Password that were sent to you on your emailed order receipt, this will activate your tune and run the TuneLoader software. With the ignition turned on, look in the bottom right hand corner of TuneLoader, you will see a red flashing LED graphic. This LED shows the connection status. It starts off flashing red, then flashing amber whilst trying to connect and when connection is complete it turns to a flashing green LED. If you can't make a connection, then please check your battery voltage, it does need to have a decent charge to connect reliably. It sometimes helps having a battery tender/charger plugged in during this process as this usually keeps the battery above 12v. We highly recommend that you carry out checks on the Throttle Position Sensor (TPS) and throttle body balance. Both will take around 10 minutes with TuneLoader and will help to ensure you get the best from your TTP performance tune. The TPS is generally a set and forget item, but it's worth checking just in case. Using TuneLoader makes it a very simple task. The tools required for this job are a T25 TORX socket/key/screwdriver, a TTP OBD2 cable and a laptop with your TTP tune installed. Warm the engine to the normal operating temperature (a 20-30 minute ride) and ensure the engine is at your prefered idle speed, then switch off the engine. 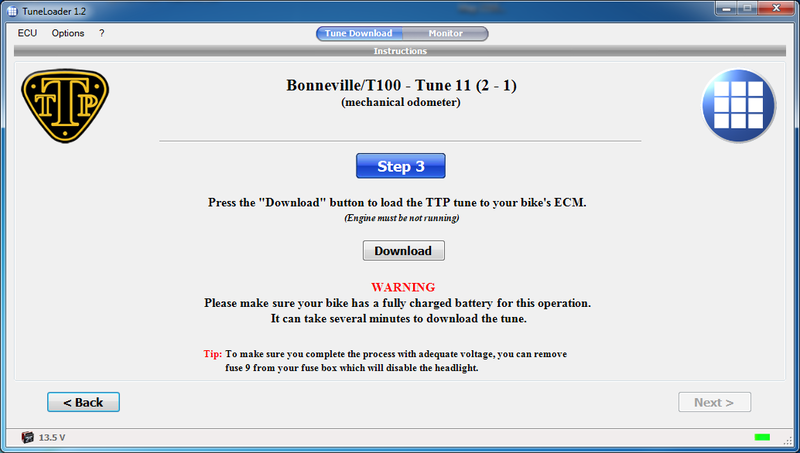 Connect your laptop to the ECM via your OBD2 cable, turn on the ignition and let TuneLoader make a connection to your bike. 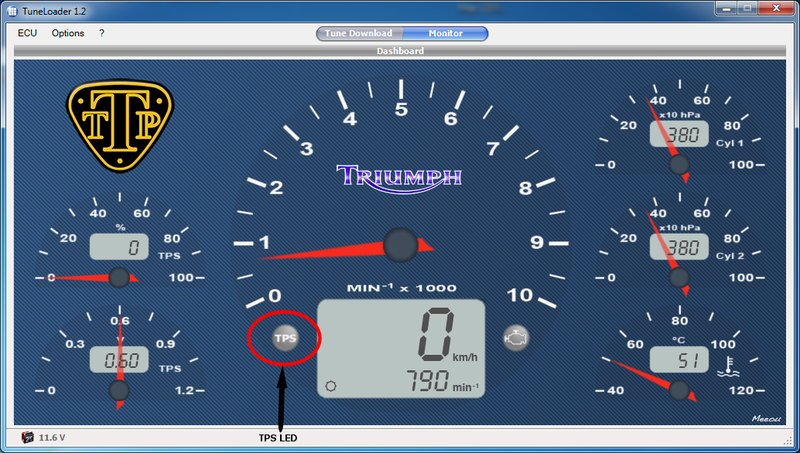 Navigate to the "Monitor" screen, on the left side at the bottom is the TPS voltage gauge. The reading when the TPS is correctly set should be 0.60v. If you determine that the TPS requires adjustment, loosen the retaining T25 TORX screw a little so you can gently turn the TPS. Make your adjustment and then tighten the retaining screw to 3.5Nm and recheck the voltage reading. Repeat the adjustment if the voltage is still outside of the specified range. Checking and adjusting the balance of your throttle bodies is simple to carry out and very worthwhile. If your throttle bodies are unbalanced by any degree you will probably feel the difference in the running of your engine. It's good practice to checked throttle body balance twice a year to keep your bike in good tune. The benefits of balanced throttle bodies will be a smoother running engine and the knowledge that both cylinders are working in sync with each other. Warm the engine to the normal operating temperature (a 20-30 minute ride) and ensure the engine is running at your prefered idle speed, then switch off the engine. Connect your laptop to the ECM via your OBD2 cable, turn on the ignition and let TuneLoader make a connection. Once you have a connection start your engine and allow it to idle. Navigate to the "Monitor" screen in TuneLoader, the two upper dials on the right side of the screen are labelled Cylinder 1 and Cylinder 2. These measure induction vacuum and can be used to balance the throttle bodies. Both of these dials should read within 10Hpa of each other with the engine at idle to achieve the perfect balance. If your throttle bodies are out of balance, then you will need to adjust the balance screw which is situated between the throttle bodies, it's the small screw with yellow paint on it. Only small adjustments should be required to bring them back to balance. N.B. If you carry out both checks/adjustments before you load your new TTP tune, let your engine cool overnight as it is necessary to start with a cold engine before loading a tune. 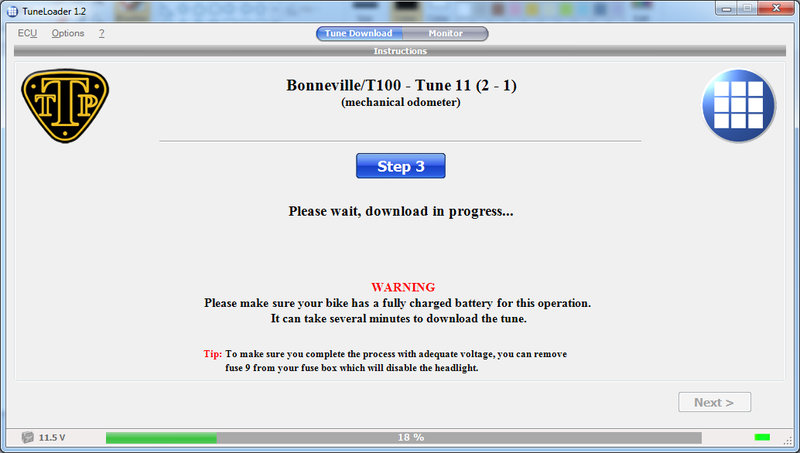 The Reset Adaption process is required after a new tune is loaded in to your bikes ECM. It's function is to reset the ECM's log files and calibrate the throttle position sensor to the new tune while idling the engine from cold and building up new data. If you don't carry out reset adaption after a new tune is downloaded to the ECM, your engine may be rough at idle and at low throttle, low revs running. 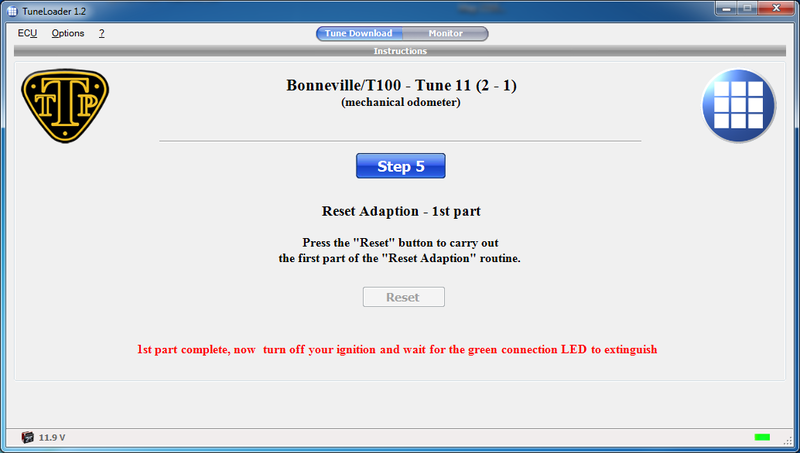 The first part of reset adaption is taken care of in step 5 of TuneLoader. When you press the "Reset" button, the adaption logs and the TPS are reset to factory defaults. The second part is to idle your engine from cold until the TPS LED illuminates on the "Monitor" page of TuneLoader. This usually takes 15-20 minutes, after which you can turn off the ignition for 2 minutes. Now your bike is ready to ride. It's worth mentioning here that if you idle your engine for 15-20 minutes in hot weather, there's a possibility the header pipes of your exhaust system will start bluing as the pipes get hotter. Some owners like the look of bluing as this was normal with Triumph twins from days of old. If you don't like it, either place fans facing the header pipes throughout the process to keep them cooler or if that's not possible, you will be able to take them back to a polished finish with a good chrome cleaner and plenty of elbow grease.